Marshall is a city in and the county seat of Harrison County in northeastern Texas in the United States. Marshall is a major cultural and educational center in East Texas and the tri-state area. At the 2010 census, the population of Marshall was 23,523. The population of the Marshall Micropolitan Area, comprising all of Harrison County, was 65,631 in 2010. Marshall was a political and production center of the Confederacy during the Civil War. Later it was a major railroad center of the T&P Railroad from the late 19th century until the mid-20th century. Activists in the city's large African American population worked to create social change through the Civil Rights Movement, with considerable support from the historically black colleges and universities here. The city is known for holding one of the largest light festivals in the United States, the "Wonderland of Lights". It identifies as the self-proclaimed "Pottery Capital of the World", for its sizable pottery industry. Marshall is referred to by various nicknames: the "Cultural Capital of East Texas", the "Gateway of Texas", the "Athens of Texas", the "City of Seven Flags", and "Center Stage", a branding slogan adopted by the Marshall Convention and Visitors Bureau. This area of Texas was developed for cotton plantations. Planters brought slaves with them from other regions or bought them in the domestic slave trade. It had a higher proportion of slaves than other regions of the state, and the wealth of the county depended on slave labor and the cotton market. The city was founded in 1841 as the seat of Harrison County after failed attempts to establish a county seat on the Sabine River. It was incorporated in 1843. The Republic of Texas decided to choose the land donated for the seat by Peter Whetstone and Isaac Van Zandt after Whetstone had proven that the hilly location had a good water source. The city quickly became a major city in the state because of its position as a gateway to Texas; it was on the route of several major stagecoach lines, and one of the first railroad lines constructed into Texas ran through it. The founding of several colleges, including a number of seminaries, teaching colleges, and incipient universities, earned Marshall the nickname "the Athens of Texas", in reference to the ancient Greek city-state. The city's growing importance was confirmed when Marshall was linked by a telegraph line to New Orleans; it was the first city in Texas to have a telegraph service. The Wyalucing plantation was the childhood home of Lucy Holcombe Pickens, the only woman whose image was used on Confederate currency. It housed the office of the Trans-Mississippi Postal Department of the Confederacy. In 1880 freedmen bought the plantation and used it for the campus of Bishop College, founded for black students; the main house was used as the president's house. By 1860, Marshall was the fourth-largest city in Texas and the seat of its richest county. Developed as cotton plantations, the county held more slaves than any other in the state. Many planters and other whites were strongly anti-Union because of their investment in slavery, but some residents of Marshall fought for the North. For example, brothers Lionel and Emmanuel Kahn, Jewish merchants in Marshall, fought on opposing sides in the conflict. When Governor Sam Houston refused to take an oath of allegiance to the Confederacy, Marshall's Edward Clark was sworn in as governor. Pendleton Murrah, Texas's third Confederate governor, was also from Marshall. The city became a major Confederate supply depot and manufactory of gunpowder for the Confederate Army, and hosted three conferences of Trans-Mississippi and Indian Territory leaders. The city was used as the capital of the exiled Confederate government of Missouri, earning it the nickname the "City of Seven Flags". This was a nod to the flag of Missouri, in addition to the six flags of nations and republics that have flown over the city. Marshall became the seat of Confederate civil authority and headquarters of the Trans-Mississippi Postal Department after the fall of Vicksburg. The city may have been the intended target of a failed Union advance that was rebuffed at Mansfield, Louisiana. Toward the end of the Civil War, the Confederate government had $9.0 million in Treasury notes and $3.0 million in postage stamps shipped to Marshall. They may have intended Marshall as the destination of a government preparing to flee from advancing armies. A former slave displays a horn in 1939 that was formerly used by planters to call slaves on the outskirts of Marshall. Many freedmen moved to Marshall from rural areas during Reconstruction, creating their own community and seeking the chance to live away from the supervision of whites. After Union troops departed at the end of Reconstruction, Democrats formed the White Citizens Party, establishing an insurgent militia dedicated to white supremacy. Marshall was occupied by Union forces on June 17, 1865. During Reconstruction, the city was home to an office of the Freedmen's Bureau and was the base for federal troops. In 1873 the Methodist Episcopal Church founded Wiley College to educate freedmen. African Americans came to the city seeking opportunities and protection until 1878. The White Citizens Party, led by former Confederate General Walter P. Lane and his brother George, took control of the city and county governments. Their militia ran Unionists, Republicans and many African Americans out of town. The Lanes ultimately declared Marshall and Harrison County "redeemed" from Union and African-American control. Despite this the African-American community continued to progress. Bishop College was founded in 1881, and Wiley College was certified by the Freedman's Aid Society in 1882. Marshall's "Railroad Era" began in the early 1870s. Harrison County citizens voted to offer $300,000 bond subsidy, and the City of Marshall offered to donate land north of the downtown to the Texas and Pacific Railway if the company would establish a center in Marshall. T&P President Jay Gould accepted the business incentive, locating the T&P's workshops and general offices for Texas in Marshall. The city immediately had a population explosion from workers attracted to the potential for new jobs here. By 1880 the city was one of the South's largest cotton markets, with crops and other products shipped by the railroad. The city's new prosperity was shown by the opening of J. Weisman and Co., the first department store in Texas. When one light bulb was installed in the Texas and Pacific Depot, Marshall became the first city in Texas to have electricity. Some nationally known crimes were tried here, including the trials for the attempted murder of Maurice Barrymore. During this period of wealth, many of the city's now historic homes were constructed. The city's most prominent industry, pottery manufacturing, began with the establishment of Marshall Pottery in 1895. Despite the prosperity of the railroad era, some city residents struggled with poverty. Blacks were severely discriminated against. At the turn of the 20th century, the Democratic-dominated state legislature passed segregation laws and disenfranchised most blacks and Hispanics, as did all the states of the former Confederacy. They were essentially excluded from the political system for more than 60 years. In the rural areas of Harrison County, there was more interaction between white people and African Americans than in the city, and whites and blacks were often neighbors. But Jim Crow rules were prominently imposed on African Americans. Several planters divided up sizable tracts of land and gave them to their former slaves, which angered poor whites. The community has developed in and around Whetstone Square, shown here in 1939. Guests lodged in the Capitol Hotel, right, and the taller Hotel Marshall directly behind it. In the 1960s the Harrison County Courthouse, center, was the site of the first sit-ins in Texas by the civil rights movement. In 1909 a field of natural gas was discovered near Caddo Lake and began to supply city needs. Under the leadership of John L. Lancaster, the Texas and Pacific Railway experienced its height during the first half of the 20th century, and Marshall's ceramics industry expanded to the point that the city was called by boosters the "Pottery Capital of the World". In 1930 what was then the largest oil field in the world was discovered at nearby Kilgore. The first student at Marshall High School to have a car was Lady Bird Johnson, a kind of progress that excited many students. During the late 19th and early 20th centuries, children of both races were forced into accepting the law of racial segregation in the state. Marshall resident George Dawson became a writer, later describing his childhood under segregation in his memoir Life Is So Good. He described how, in some instances, he and other African Americans refused the demands of Jim Crow. He rejected one employer who expected him to eat with her dogs. As blacks were being excluded from politics and tensions rose, more lynchings of black men took place, a form of extrajudicial punishment and social control. Beginning in the late 19th century, a total of 14 African-American men were lynched in the county, the third-highest total in the state. Suspects were often brought to Marshall for their murders, or taken from the county jail before trial and hanged in the courthouse square for maximum effect of terrorizing the black population. Between October 1903 and August 1917 at least twelve people were lynched in Marshall, all black men. [not specific enough to verify] Not all instances of lynching were reported by authorities, so this number is likely an undercount. In the early and mid-20th century, Marshall's traditionally black colleges, Wiley and Bishop, were thriving intellectual and cultural centers. The writer Melvin B. Tolson, who was part of the Harlem Renaissance in New York City, taught at Wiley College. While painter Samuel Countee, a Texas born student of Bishop college, went on to exhibit in the Harmon Exhibitions in 1935--1937 and won a scholarship to study at the Boston Museum of Fine Art school. Countee, who studied at Bishop in the mid-thirties, went on to have a successful career as a teacher and artist in the NYC area where he lived and also died. Inspired by the teachings of professors such as Tolson, students and former students of the colleges mobilized to challenge and dismantle Jim Crow in the 1950s and 1960s. Fred Lewis, as the secretary of the Harrison County NAACP, challenged the White Citizens Party in Harrison County, the oldest chapter in Texas, and the laws it enforced. This suit overturned Jim Crow in the county with the Perry v. Cyphers ruling. Heman Sweatt, a Wiley graduate, tried to enroll in the University of Texas at Austin Law School, but was denied entry because of his race. He sued and the United States Supreme Court ordered the desegregation of postgraduate studies in public universities in Texas in its ruling in Sweatt v. Painter (1950). James L. Farmer Jr., another Wiley graduate, became an organizer of the Freedom Rides and a founder of the Congress of Racial Equality, which were active throughout the South. The Civil Rights Movement reached into the 1960s, 1970s and 1980s. In the 1960s, students organized the first sit-ins in Texas, in the rotunda of the county courthouse on Whetstone Square, protesting continuing segregation of public schools. This governmental practice had been declared unconstitutional in 1954 by the US Supreme Court in Brown v. Board of Education. In 1970, all Marshall public schools were finally integrated. Also in that year, Carolyn Abney became the first woman to be elected to the Marshall City Commission. In April 1975, nearly a decade after passage of the federal Voting Rights Act of 1965, local businessman Sam Birmingham became the first African American to be elected to the city commission. In the 1980s, he was elected as the city's first African-American mayor. Birmingham retired in 1989 for health concerns and was succeeded by his wife, Jean Birmingham. Marshall's railroad industry declined during the restructuring of the industry; most trains were converted to diesel fuel, and many lines merged. Expansion of airlines and the construction of the Interstate Highway System after World War II also led to railway declines. The T&P Shops closed in the 1960s, and T&P passenger service ceased in 1970. The Texas oil bust of the 1980s devastated the local economy. The city's population declined by about 1,000 between 1980 and 1990. During the mid-20th century, the city lost many of its historic landmarks to redevelopment or neglect. For a time people preferred "modern" structures; other buildings were demolished because tax laws favored new construction. By 1990, Marshall's opera house, the Missouri Capitol, the Moses Montefiore Synagogue, the original Viaduct, the Capitol Hotel, and the campus of Bishop College (including the Wyalucing plantation house) had been demolished. In the 1970s the city began to study historic preservation efforts of nearby Jefferson, and has since emphasized preservation of historic assets throughout the remainder of the 20th century. The Old Harrison County Courthouse is illuminated for the "Wonderland of Lights". Due to newly completed construction projects, the city was one of ten designated in 1976 as an All-America City by the National Civic League. In 1978, Taipei mayor Lee Teng-hui, and Marshall mayor William Q. Burns, signed legislation recognizing Marshall as a sister city to the much larger Taipei. During this period Bill Moyers won an Emmy for his documentary, Marshall, Texas: Marshall, Texas, chronicling the history of race relations in the city. In terms of the city's economy, the 1960s through 1980s were a period of social and economic decline, largely because of the oil industry and manufacturing changes. Longview surpassed it in population and economy. In the 1980s and 1990s the city began to concentrate on diversifying its economy; tourism has been increasingly important. Two new festivals were established, the Fire Ant Festival, and the Wonderland of Lights, joining the longstanding Stagecoach Days. The Fire Ant Festival gained national attention through being featured on television in programs such as The Oprah Winfrey Show. The Wonderland of Lights became the most popular and one of the largest light festivals in the United States. By 2000, the Wonderland of Lights had become such a part of the cityscape that the lighted dome of the Old Courthouse was the most recognizable symbol of the city. 2011 marked the 25th anniversary of the Wonderland of Lights festival. The city expected more than 200,000 visitors during the event's 40-day run, beginning with the official lighting ceremony on November 23, 2011. In the 2000s, the Sam B. Hall Jr. U.S. Court House became one of the busiest federal courts because of a high number of patent suits, the second highest total in the nation. During the 2000s, the downtown had moderate economic growth, which supported restoration of significant buildings. By 2005, the Joe Weisman & Company building, the T&P Depot, the former Hotel Marshall (now known as "The Marshall"), and the former Harrison County Courthouse were either restored or under restoration. Restaurants, boutiques, and loft apartments were developed in downtown, adding to the variety of its daily life and pedestrians on the streets. Some projects adapted historic structures for re-use. Many historic homes outside of downtown continue to deteriorate. Some structures in moderate condition were approved for demolition for replacement by prefabricated or tin structures. Whetstone Square has become quite busy again, with few empty buildings around it. Lack of funding and manpower has slowed movement on demolition and salvage of historic homes. The Sam B. Hall, Jr. Federal Courthouse has been the venue for several cases challenging state practices under provisions of the Voting Rights Act of 1965. For instance, the Democratic Party challenged the 2003 redistricting by the state legislature, arguing that it diluted minority rights. Combined with two other cases, these issues were heard by the US Supreme Court in League of United Latin American Citizens v. Perry (2006). It upheld the state's actions, with the exception of Texas's 23rd congressional district; redistricting was required that affected neighboring districts as well. It had little effect on the new Republican majority of the Texas Congressional delegation after the 2004 elections. An unusually high number of patent lawsuits are being filed in the United States District Court for the Eastern District of Texas which includes Marshall, Tyler, and Texarkana. TiVo sued EchoStar over DVR patent rights. Marshall has a reputation for plaintiff-friendly juries for the 5% of patent lawsuits that reach trial. This has resulted in 78% plaintiff wins. The number of patent suits filed in 2002 was 32, and the number for 2006 has been estimated at 234. The second-highest number of patent suits nationally are filed here, after the United States District Court for the Central District of California in Los Angeles. The trend continued through 2011 in the Eastern District of Texas, which includes Marshall, with the number of patent lawsuits more than doubling from 2010. Marshall was profiled on This American Life, as its juries' support of plaintiffs in patent suits has generated controversy. The city entered into a legal battle with local residents and environmentalists about the amount of water it could draw from Caddo Lake, the source of the city’s water. This issue dominated city-county relations during the decade. On January 18, 2010, Dr. John Tennison, a San Antonio physician and musicologist, publicized his research that found that boogie-woogie music was first developed in the Marshall area in the early 1870s. It originated among African Americans working with the T&P Railroad and the logging industry. On May 13, 2010, the Marshall City Commission unanimously passed an ordinance declaring Marshall to be "the Birthplace of Boogie Woogie." On September 2, 2018, the Harrison County Historic Commission unveiled a Texas Historic Marker declaring Marshall as the birthplace of Boogie Woogie. The marker stands near the entrance to the T&P Railroad Museum in the historic Ginocchio district north of downtown. Maplecroft is the centerpiece of the Starr Family Home State Historic Site. Marshall is roughly 150 miles (240 km) east of Dallas, Texas and 40 miles (64 km) west of Shreveport, Louisiana. The intersection of US 80 and US 59 and the intersection of US 59 and Interstate 20 are located within the city limits of Marshall. According to the United States Census Bureau, the city has a total area of 29.7 square miles (76.8 km2), of which 29.6 square miles (76.6 km2) are land and 0.1 square miles (0.2 km2), or 0.22%, are water. Marshall is closer to the capitals of Arkansas (Little Rock, 217 miles (349 km)) and Mississippi (Jackson, 256 miles (412 km)) than it is to the capital of Texas (Austin, 275 miles (443 km)). The city lies within the Eastern Interconnection rather than the Texas Interconnection, making it part of only 15% of the state to lie outside of that power grid. The city is bisected along a north-south axis by East End Boulevard (US 59). The eastern half of the city is bisected along an east-west axis by US 80 which east of its intersection with US 59 is called Victory Drive and west of US 59 is named Grand Avenue. The Harrison County Airport and Airport Baseball Park are located to the south of Victory Drive off of Warren Drive. To the west of US 59, south of Pinecrest Drive, are older suburbs; north of Pinecrest Drive the oldest portion of the city stretches northward over seven hills. This portion of the city radiates out from downtown which is centered on the Old Harrison County Courthouse in Peter Whetstone Square. Immediately to the north of the square is the Ginocchio National Historic District where the city's Amtrak station is located. This region of the city is bisected along an east-west by Grand Ave. (US 80). Spreading out from downtown is a belt of Antebellum and Victorian homes centered on Rusk and Houston Streets. To the west of downtown are some of the oldest African-American neighborhoods in Texas, centered on Wiley College. To the north of Grand Avenue (US 80) are neighborhoods that were built largely by employees of the Texas and Pacific Railway. In addition to the Ginocchio National Historic District, this part of the city is home to East Texas Baptist University, and four historic cemeteries: Marshall Cemetery, Powder Mill Cemetery, Greenwood Cemetery, and Marshall Hebrew Cemetery. Marshall has a humid subtropical climate, characterized by hot summers and fairly mild winters. On average, Marshall receives 51.2 inches (1,300 mm) of rain per year. The precipitation is relatively evenly spread throughout the year, with only the summer months of July and August receiving less than 3.5 inches (89 mm) on average. In the spring months during the transition from winter to summer, severe weather is not uncommon, and tornadoes have hit the city in the past, including an F2 that struck the southern side of town in 2000, wiping out a Domino's Pizza on US Highway 59. Summers in Marshall are hot and humid, with average temperatures higher than 85 degrees Fahrenheit (29 °C) from June through September. Temperatures above 100 °F (38 °C) are not uncommon, with a highest recorded temperature of 112 °F (44 °C) in August 1909. In 2008, Hurricane Ike struck Marshall hard with winds over 60 miles per hour (100 km/h). 82% of the population in Marshall was without power for at least 24 hours. At the census of 2000, there were 23,935 people, 8,730 households, and 6,032 families residing in the city. The population density was 809.5 people per square mile (312.5/km²). There were 9,923 housing units at an average density of 335.6 per square mile (129.6/km²). The racial makeup of the city was 54.7% White, 38.6% African American, <0.1% Native American, 0.6% Asian, <0.1% Pacific Islander, 4.8% from other races, and 0.9% from two or more races. Hispanic or Latino of any race were 8.6% of the population. There were 8,730 households out of which 32.2% had children under the age of 18 living with them, 46.4% were married couples living together, 19.0% had a female householder with no husband present, and 30.9% were non-families. 28.0% of all households were made up of individuals and 14.0% had someone living alone who was 65 years of age or older. The average household size was 2.55 and the average family size was 3.12. In the city, the population was spread out with 26.1% under the age of 18, 13.4% from 18 to 24, 24.6% from 25 to 44, 20.3% from 45 to 64, and 15.5% who were 65 years of age or older. The median age was 34 years. For every 100 females, there were 87.9 males. For every 100 females age 18 and over, there were 82.2 males. The median income for a household in the city was $30,335, and the median income for a family was $37,438. Males had a median income of $30,146 versus $21,027 for females. The per capita income for the city was $15,491. About 17.8% of families and 22.8% of the population were below the poverty line, including 32.5% of those under age 18 and 15.1% of those age 65 or over. The City of Marshall has a Council-manager form of municipal government, with all governmental powers resting in a legislative body called a Commission. The Commission passes all city laws and ordinances, adopts budgets, determines city policy, and appoints city officials, including the City Manager. The city manager serves as the executive of the city government and is in charge of enforcing city laws and administering the city's various departments. The City Commission has seven members, each elected from a single-member district. Districts 1−4 divide the city into four districts, and the districts 5−7 divide the city into three districts that overlay Districts 1−4. So every location in the city falls in two districts, one from each set. Each Commissioner is elected to a two-year term. Districts 1−4 hold elections in odd-numbered years and districts 5−7 in even years; elections are held in the spring. After each election, the City Commission selects a commissioner to serve as Chairman of the Commission, generically called a Mayor, until after the next year's election. If no one files to run against a commissioner, as happened with District 1 in 2005, the commissioner is reinstated and an election for that district is not held that year. The City Commission meets twice a month on the second and fourth Thursdays, in addition to any special sessions that are called or regular meetings that are canceled. The Commission provides a public forum before each regular session, providing citizens the opportunity to address the commission for two minutes without forward notice, with notice additional time may be scheduled. The Commission meetings are broadcast on radio and on the local government-access television (GATV), public-access television cable TV station. Marshall is represented in the Texas Senate by Republican Kevin Eltife, District 1, and in the Texas House of Representatives by Republican Chris Paddie, District 9. The Texas Department of Criminal Justice (TDCJ) operates the Marshall District Parole Office in Marshall. At the Federal level, the two U.S. Senators from Texas are Republicans John Cornyn and Ted Cruz; Marshall is part of Texas' US Congressional 1st District, which is currently represented by Republican Louie Gohmert. The United States Postal Service operates the Marshall Post Office. 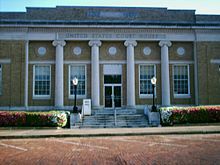 The majority of the nation's patent litigation is handled in or around Marshall, Texas. Marshall's economy is diversified and includes services such as Insurance claims processing at Health Care Service Corporation, also known as BlueCross BlueShield of Texas, education at several institutes of higher learning, manufacturing such as wood kitchen cabinets at Republic Industries and pottery at several manufacturers. Tourism is also an important industry with about one million tourists visiting the city each year. Marshall has a local sales tax of 2.0%. The Marshall Economic Development Corporation or MEDCO lobbies companies to locate in Marshall and offers incentives to businesses that do. The Greater Marshall Chamber of Commerce represents the interests of local businesses to local, state, and national leaders. Marshall is served by two taxicab companies. The Harrison County Airport is located in Marshall. Ongoing expansion of Interstate 69 from Indianapolis, Indiana to Victoria, Texas will create Interstate 369 branching off from Tenaha, Texas and go north to Texarkana, Texas using U.S. Highway 59 via Marshall. Amtrak's daily Texas Eagle train leaves at 7:30 p.m. for St Louis and Chicago. The Texas Eagle leaves for Dallas, Austin, and San Antonio at 7:50 a.m., and continues to Los Angeles three days a week. Secondary and primary education in the city is almost entirely conducted by the Marshall Independent School District, with almost than six thousand students at eight campuses. Trinity Episcopal School serves students from pre-school (age 3) through 8th grade at two campuses. St. Joseph Catholic School is now closed. More than 3,500 students annually attend colleges in the city, bringing energy to the area: East Texas Baptist University, Wiley College, Texas State Technical College-Marshall, and Panola College-Marshall. Wiley College is one of the oldest historically black institutions in the United States. It was the setting of the film The Great Debaters, which depicted Wiley College's debate team's struggle for racial equality. They challenged the Harvard University debating team on the national circuit. In reality, Melvin Tolson's 1935 debate team, which included civil rights leader James L. Farmer, debated and defeated that year's Pi Kappa Delta Forensic Society's national champions, the University of Southern California (Sources "Bay Bare the Heart," by James L. Farmer, Jr. and AMC documentary, "The Real Great Debaters." The city has one newspaper, The Marshall News Messenger, a subsidiary of the nearby Longview newspaper. Four radio stations, KZEY (AM), KMHT (AM), KMHT (FM), and KBWC, serve the Longview/Marshall market. Marshall has an ABC news office. The city is within the reception area of broadcasters based in Shreveport, Louisiana: KTBS (ABC), KSLA (CBS), KMSS (FOX), KTAL (NBC), KPXJ (The CW), KSHV-TV (My Network TV), and KLTS (Louisiana Public Broadcasting). The local cable company, Fidelity Communications (formerly Cobridge Communications), provides public-access television channels that show local football games produced by KMHT radio, and meetings of the City and County Commissions (both live and replayed), as well as streaming audio from KMHT. Marshall is also the home of the weekly podcast "Beyond the Pine Curtain". Starr Family Home State Historic Site, 407 W. Travis St.
People from Marshall are called "Marshallites". William Henry Pope — politician, self-described "Jim Crow Senator"
Frank Shelby Groner (1877-1943) — President of College of Marshall. ^ "State Rep. Christopher "Chris" Paddie District 9 (R-Marshall)". Texas Tribune. Archived from the original on May 24, 2013. Retrieved June 26, 2013. ^ "US Board on Geographic Names". United States Geological Survey. 2007-10-25. Archived from the original on 2012-02-26. Retrieved 2008-01-31. ^ a b "Geographic Identifiers: 2010 Census Summary File 1 (G001): Marshall city, Texas". American Factfinder. U.S. Census Bureau. Retrieved February 7, 2018. ^ "Geographic Identifiers: 2010 Census Summary File 1 (G001): Marshall, TX Micro Area; Texas". American Factfinder. U.S. Census Bureau. Retrieved February 7, 2018. ^ "Texas State Travel Guide/Wonderland of Lights". ^ "About Marshall Texas". Marshall Chamber of Commerce. Archived from the original on 2007-08-31. Retrieved 2007-10-15. ^ a b Lale, p. 7. ^ a b c Campbell, Randolph B. (2001-07-13). "Marshall, Texas". The Handbook of Texas Online. Retrieved 2006-05-25. ^ a b Lale, p. 12. ^ Davis, William C. (2002). Look Away! : A History of the Confederate States of America (1st ed.). Free Press. p. 413. ISBN 0-684-86585-8. ^ Campbell (2003), p. 286. ^ Campbell (2003), p. 272. ^ Berglund, Ernest (1948). History of Marshall (1st ed.). ^ The Lynching Calendar: Names A-L.
^ "THE PAN-AFRICAN RESEARCH AND DOCUMENTATION CENTER -Archived copy". Wayne State University. July 1, 1998. Archived from the original on 2007-05-29. Retrieved 2008-04-12. ^ The Birmingham News, Birmingham, Alabama; 1913-02-27. ^ Boston Guardian, Boston, Massachusetts; 1914-04-30. ^ Campbell (2003), p. 428. ^ "Justices Back Most G.O.P. Changes to Texas Districts". The New York Times. June 28, 2006. ^ a b Creswell, Julie (2006-09-24). "So Small a Town, So Many Patent Suits". The New York Times. Archived from the original on 2009-04-24. Retrieved 2007-10-15. ^ Curriden, Mark (2013-02-12). "Patent lawsuits skyrocket in Texas". Dallas Morning News. Retrieved 2013-10-24. ^ "441: When Patents Attack!". 2012-07-22. Archived from the original on 2012-01-04. ^ a b "Monthly Averages for Marshall, TX". August 2011. Retrieved January 14, 2008. ^ Monthly Averages from Weather.com, includes table format as well. Retrieved July 16, 2006. ^ "Population and Housing Unit Estimates". Archived from the original on May 29, 2017. Retrieved June 9, 2017. ^ Carolyn Stewart, ACSD. "Census of Population and Housing - U.S. Census Bureau". Archived from the original on 2006-02-08. ^ City of Marshall. Retrieved 2009-06-03. ^ "Parole Division Region I Archived 2011-09-28 at the Wayback Machine." Texas Department of Criminal Justice. Retrieved May 15, 2010. ^ "Post Office Location - MARSHALL Archived 2012-06-09 at the Wayback Machine." United States Postal Service. Retrieved May 15, 2010. ^ "The Small Town Judge Who Sees a Quarter of the Nation's Patent Cases". vice.com. 5 May 2016. Retrieved 30 April 2018. Wikimedia Commons has media related to Marshall, Texas. This page was last edited on 23 April 2019, at 02:19 (UTC).